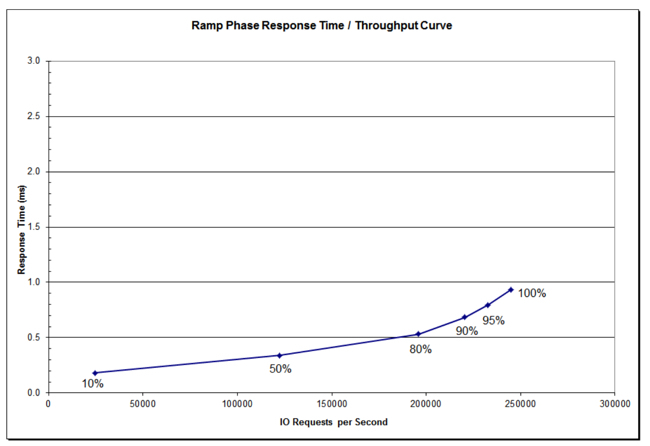 Flash array response times climb as load increases, with good ones able to delay the response time uptick for longer. For all the vendor systems shown, response time (ms) climbed as the percentage benchmark task load increased from 10 per cent to 100 per cent. This is true for audited SPC-1 benchmark results – we have no other data. 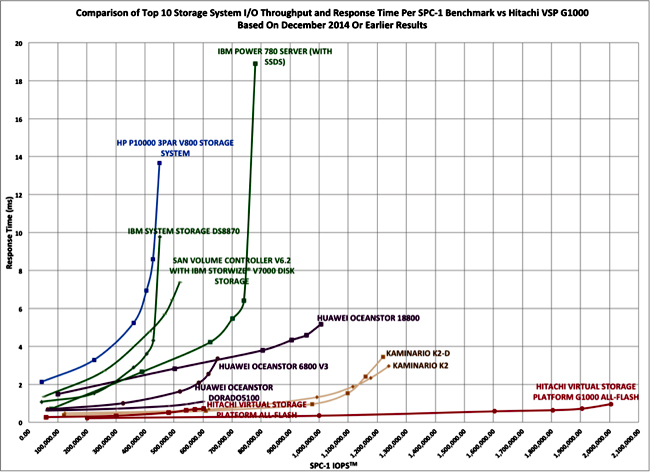 So, within this set, the chart shows HDS' VSP G1000 doing best of all, with some other systems climbing above the 2ms level as the load – expressed in IOPS – increases. IBM systems (the DS8870, SVC with Storewide V7000 and POWER 780 server) stand out as being particularly peaky on the chart. HP's P10000 3OPAR V800 also peaks high and relatively early. Huawei systems last longer before rising to the 100 per cent load stop point, with Kaminario K2 DRAM and NAND systems lasting longer still, to just above 1.2 million IOPS. Peak IOPS are important, but better systems deliver a pretty consistent latency level without pronounced hockey stick-style peaks; they scale more elegantly as the load increases and users thus have scalability headroom.